There should have been maple apple cake. 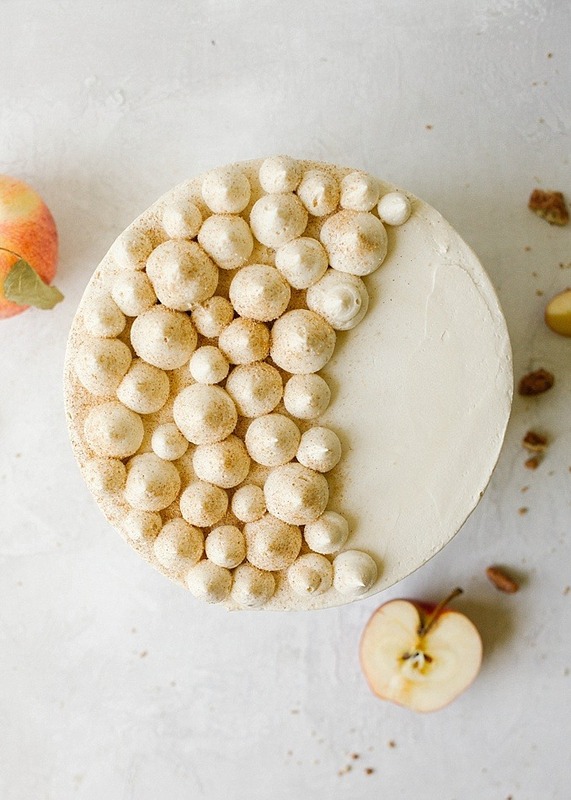 Yes, a birthday can be well-celebrated without stacked autumnal desserts, but if you only turn thirty once, shouldn’t it include the best tasting cake of the year? If you’re celebrating a birthday anytime soon, don’t make my mistake- make sure your party includes this cake. As you get older, birthdays get kinda weird. Sometimes it feels a little uncomfortable to let people celebrate you the way they might have in your teens or early twenties. There’s usually a million other things to do and a dwindling list of friends who are available to celebrate. Sometimes there are kids involved, which makes the idea of planning any party that you can’t buy in a hyper-themed box set from Target seem like a huge waste of time. Energy, as with most other things in adulthood, is a limiting factor here too, because who actually wants to plan or order one more thing, particularly if it can’t be done from the convenience of the Amazon app on your phone? It feels right to celebrate other people. I’m the first one to volunteer a cake or a bubbly cocktail when a friend’s birthday rolls around. I have stacks of birthday cards just waiting to be personalized and delivered to the people I love. 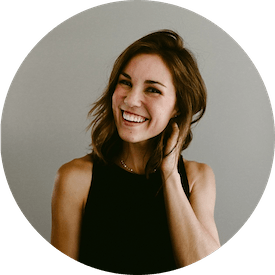 But while I adore birthdays or any other excuse for confetti and balloons, there’s a little bit of pride that gets in the way when it comes to celebrating myself. Isn’t that gross? On one hand, I don’t want to be the self-centered fool who says, “Look at me, look at me, it’s my birthday! Buy me a crown and make me a cake, minion!” But on the other hand, I kinda like the idea of rolling up to my own birthday party feeling like Beyonce- a posse of girlfriends, popped bottles, and self-assured sass in tow. Even the most modest of people have to admit that there’s nothing like being the birthday queen. Candles and champagne, confetti and cheers make even the most conservative human feel like the million bucks they deserve to be on the annual recognition of their birth. Is there anything wrong with wanting to feel the love? This year, I felt celebrated. My girlfriends changed a scheduled meeting into an impromptu birthday party and my family traveled north to celebrate with presents and pie. My husband treated me to several thoughtful birthday happies, and it didn’t hurt that we wound up in Chicago for my big day. Gifts and cake and cards are fine, but the best part of a birthday is being loved on by the people you love back; no amount of Beyonce can top that feeling. My one regret this year is that I didn’t get to eat this maple apple cake. I want this cake to be my birthday cake. This is the kind of dessert I want to eat for breakfast, lunch, and dinner. As heinous it is to admit, I want to frost my entire face with the maple buttercream from this cake and casually lick it off all day long. If that makes me a disgusting human, I frankly do not care. 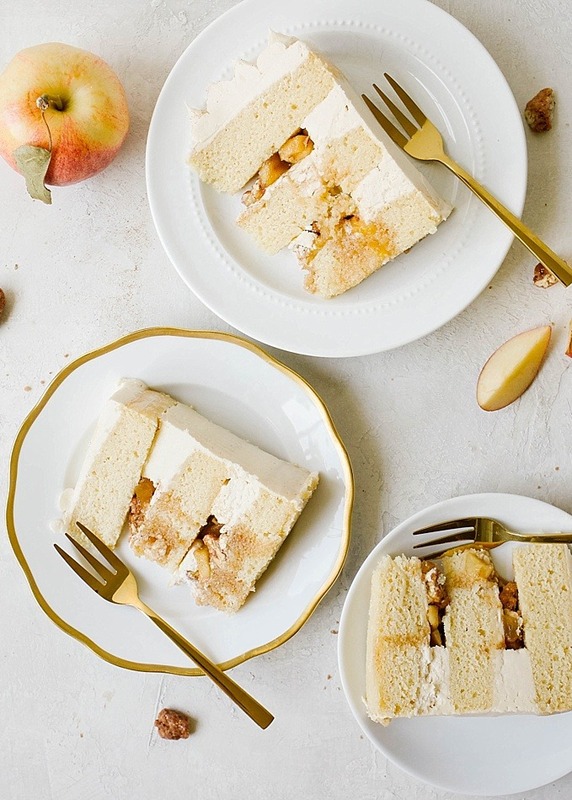 Three rounds of buttermilk cake layered with a syrupy, fresh apple filling and candied nuts, this maple apple cake is a stunner and nothing short of indulgent. 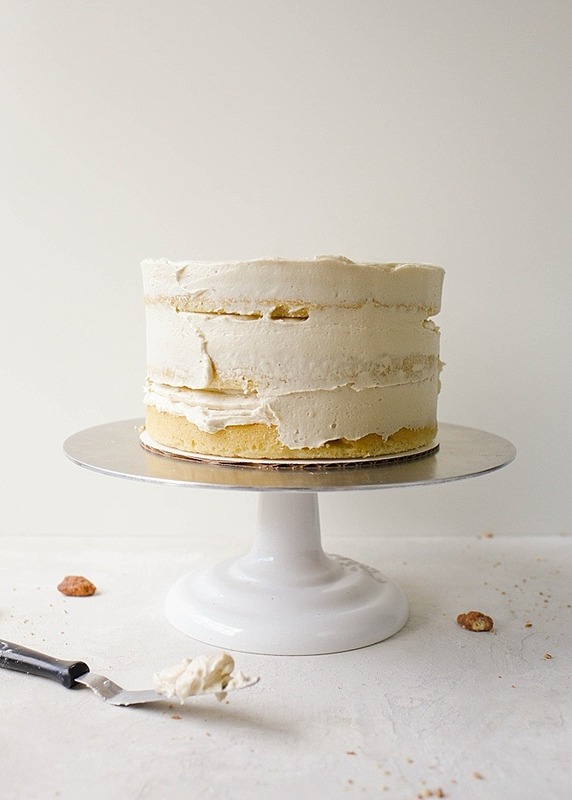 The buttercream is sweetened with brown sugar and maple syrup, the perfect addition to such a fall-tasting cake. If warm flavors, fresh fruit, and the optional addition of bourbon sounds like a winning combination to you, this maple apple cake just may be the stuff your dreams are made of. To prepare it, we start by baking up some cake layers. I decided the added tang of buttermilk would help to offset some of the cake’s sweetness, so I adapted a favorite recipe from this cake. The cake layers can be baked ahead, wrapped, and frozen, making day of cake assembly fairly simple. The apple filling is also a make-ahead item, consisting of fresh apples, butter, and brown sugar. 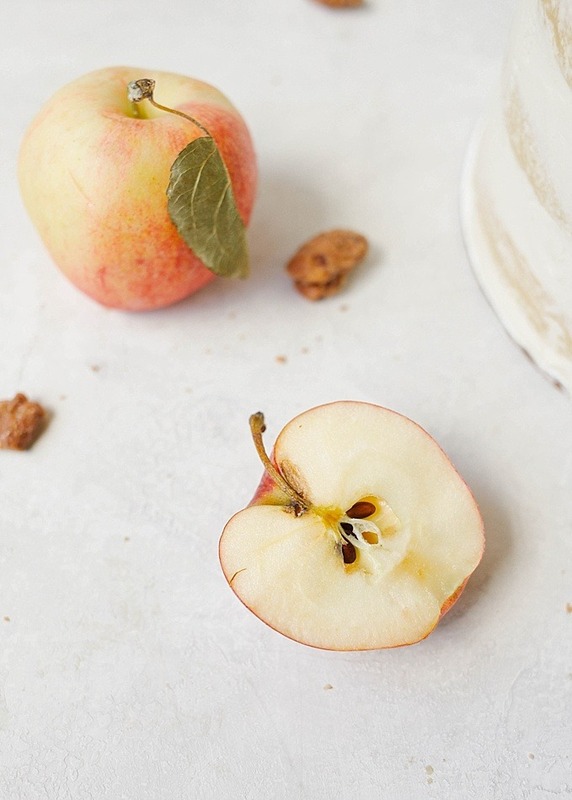 If your adult palate is so inclined, try out this maple apple cake with a bit of bourbon added to the filling. Even though the alcohol cooks off, those warm bourbon flavors remain and even the least discerning tastebuds will be able to tell that this cake has a punch of something special. On the day you plan to assemble the cake, prepare your maple frosting, level your cakes, and begin stacking. The apple filling is pooled between cake layers with a dam of frosting and is sprinkled with a handful of chopped candied nuts. Roasted nuts can be substituted here, but certainly a party cake like this deserves the pizazz of caramelized sugar. This maple apple cake will keep well in the fridge for a few days, but unless you’re eating it all by yourself, I can almost guarantee it won’t last that long. 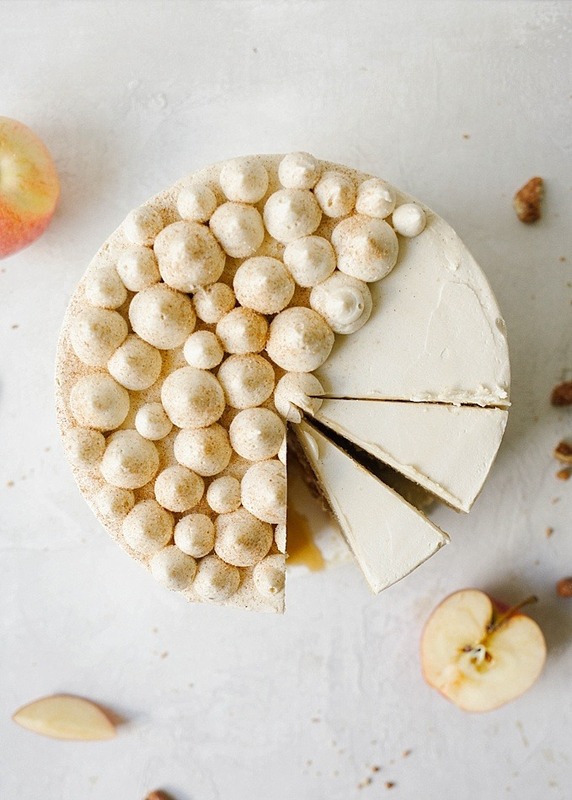 I’m sharing today’s maple apple cake along with a number of other apple recipes prepared by a few blogger friends for the #aisforapples party. If you’re dying to use up all of that October produce, be sure to check out the other recipes listed below. Many thanks to Rebecca, Ruth, and Annie for rallying the troops in this apple extravaganza. 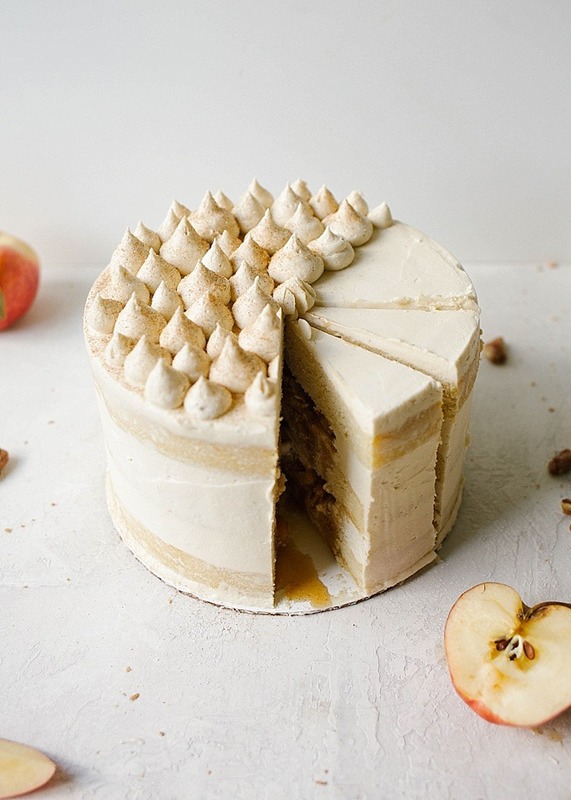 Give this maple apple cake a try and celebrate your people well this week. Happy Thursday and happy fall, ya’ll! 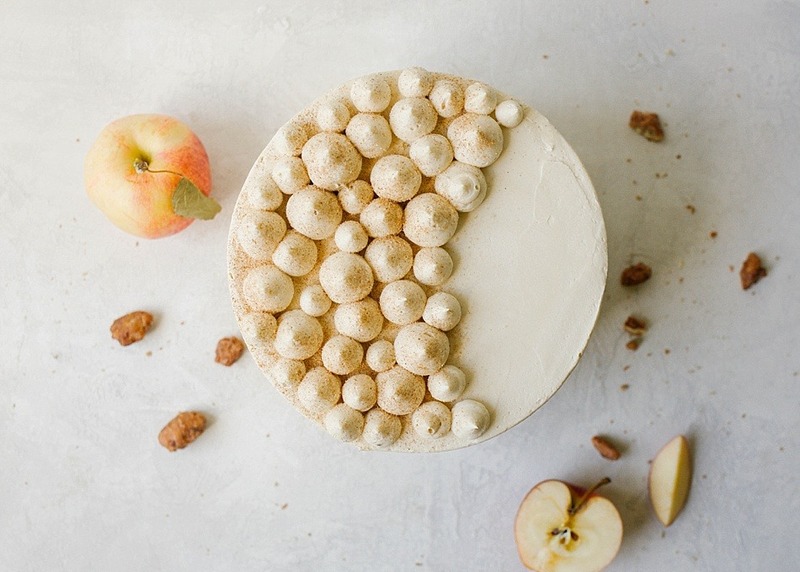 This maple apple cake is three layers of buttermilk cake filled with a bourbon apple pie filling, candied nuts, and maple buttercream. In a medium saucepan over medium heat, cook the butter, stirring continuously until it melts and barely begins to turn golden brown. Immediately add the apples and stir to combine. Add the remaining ingredients, bring to a simmer, and cook for 5 minutes or until the juices have thickened slightly and the apples have barely softened. Remove the filling to a heat-safe bowl and cool completely prior to using. Preheat the oven to 350 degrees. Grease the sides and line the bottoms of 3-8” round cake pans with parchment paper and set aside. In a small bowl, combine the cake flour, baking powder, and salt and set aside. In a large bowl or the bowl of a stand mixer, cream together the butter, sugar, and brown sugar on medium speed until light and fluffy, about 2 minutes. Scrape the sides of the bowl with a spatula and add each egg one at a time on low speed, mixing just until combined. Scrape the sides of the bowl. Add about 1/3 of the dry ingredients followed by the vanilla and about half of the buttermilk. Mix until combined and then repeat this process once more, finishing by adding the last third of the dry ingredients. Scrape the sides of the bowl and fold in any unincorporated bits of batter. Distribute the batter evenly among the three pans and bake in the preheated oven 20-25 minutes or until a toothpick inserted comes out clean. Allow to cool completely prior to assembling cake. Cream the butter in the bowl of a stand mixer or a large mixing bowl on medium speed until light and fluffy, about 2 minutes. Add the brown sugar and cream for an additional minute. Scrape the sides of the bowl and add the confectioner’s sugar. Mix on low speed until incorporated and then drizzle in the maple syrup. Beat on medium speed until well combined. If needed, add a bit of water to thin out frosting or add a bit more powdered sugar to thicken up. You can also briefly place the frosting in the fridge to firm up as needed. Use a serrated knife to level the cakes. Smooth a small amount of frosting on an 8” cake board or plate and center a single cake layer on top. Smooth a thin layer of frosting on top of the cake layer. Using a piping bag (see notes) fitted with a large round tip, pipe a dam around the outer rim of the top of the cake. The dam should be at least ¼-1/2” tall to prevent the apple filling from squirting out the sides. Spread approximately half of the apple filling inside the dam and sprinkle with about 1/3 of the nuts. Pipe a bit of frosting on top of the apple filling to help the next layer of cake stick. Stack the second cake layer on top and repeat the entire process once more. Place the final cake layer on top. Spread a thin coat of frosting (crumb coat) all over the cake and allow it to set up in the fridge prior to applying the final coat of frosting. You can skip this step if desired. Decorate the top of the cake with a few nuts and extra frosting, if desired. Cake will keep in the refrigerator covered in plastic for up to three days. If you don’t have a piping bag, you can place 1-1/2 cups of frosting in a freezer Ziploc bag. Seal the bag and snip one of the corners off the end of the bag and use that to pipe frosting. You can substitute different varieties of berries here, but the amount of sugar needed in the filling will differ based on which berry you choose. Adjust according to your preference. 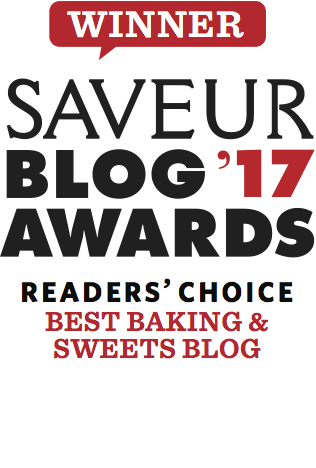 Just came across your website I am a new baker and this cake looks absolutely amazing (not to mention that we , Canadians are obsessed with Maple syrup! quick question If I only want to make one or two layers instead of three I assume I can just divide the ingredients by two or three right ? any tips that may help me reach a perfect cake without ruining it ??? Gosh I just found your blog and I am overwhelmed by your lovely pictures and recipes. What fun to read. Over Christmas this year I am determined to master the piping bag and this cake could be the very thing to help me overcome piping bag phobia. It looks adorable. Yes! Oh, thank you for the kind words!! You can TOTALLY work a piping bag. It takes some practice, but just have fun with it. 🙂 Looking forward to seeing the results! Wow, this looks absolutely incredible! ohhh, I hope you’ll try! For the Maple buttercream is the butter one or two cups?230gm equals one cup. Maral, bless you for finding that typo! It’s two cups (450 gm) of butter. Do you recommend any particular type of apple? I typically use Granny Smith or Granny Smith for baking, however with this filling I haven’t found much of a difference with other varieties. I made a batch with gala and it was just as delicious with great texture! What tip did you use in piping the decorations on top? It looks lovely! Tastes very yummy BUT I don’t like the gritty brown sugar frosting, did I do something wrong? Oh no! I haven’t had that happen before. To verify- did you use regular brown sugar or granulated brown sugar. We want the moist regular brown sugar. Also, did you cream the butter and brown sugar the appropriate amount? I’m sorry to hear it didn’t come out as it should LMK and I’m happy to help! Nadia, I really don’t think you would have needed to cream any longer than that. if you used regular brown sugar and creamed for that long and didn’t make any substitutions then I really am stumped. If the icing was too stiff you could add a smidge of liquid, but truly, I’m stumped otherwise. I’m sorry it didn’t turn out as you’d prefer! This cake is everything ! Can’t wait to try it!! ohhh, I hope you will! You’re right- typically when there is an acidic ingredient in the recipe (like the buttermilk!) baking soda is a natural addition. In this case, I adapted this recipe off of another I use and had great results with it as it was so I didn’t change it! You could definitely try subbing in soda for some of the powder. I think the ratio is typically to use 1/4 the amount of baking soda that called for of powder.